The 6’x10′ Palram Amber 68 Skylight Shed has such a fantastic look that is pretty much impossible not to be impressed the first moment you lay your eyes on it. 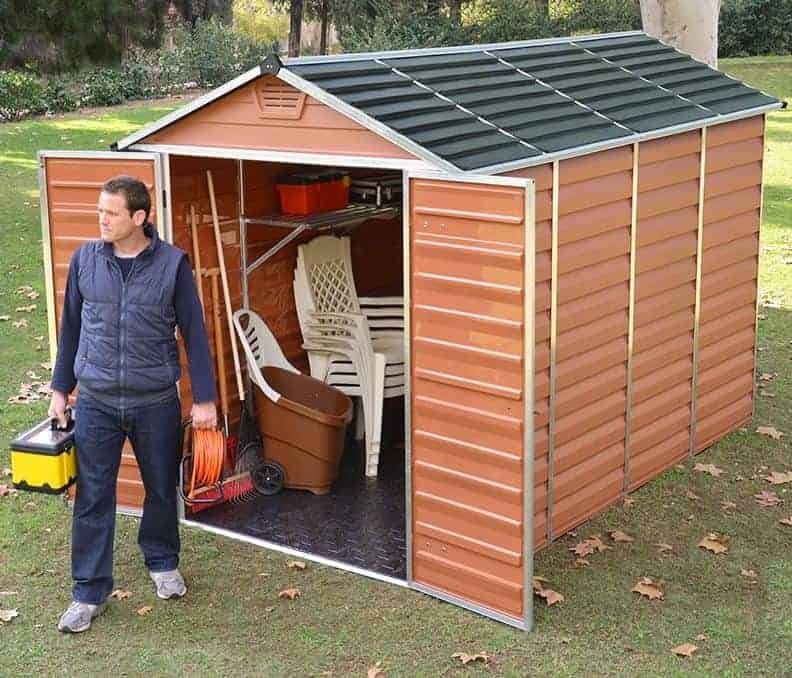 Offering a lot of space to keep things safe from the rain or just organised properly, you will have a lot of fun making use of this shed. The two large double doors will make getting something as large as a lawn mower inside no trouble at all to get inside. 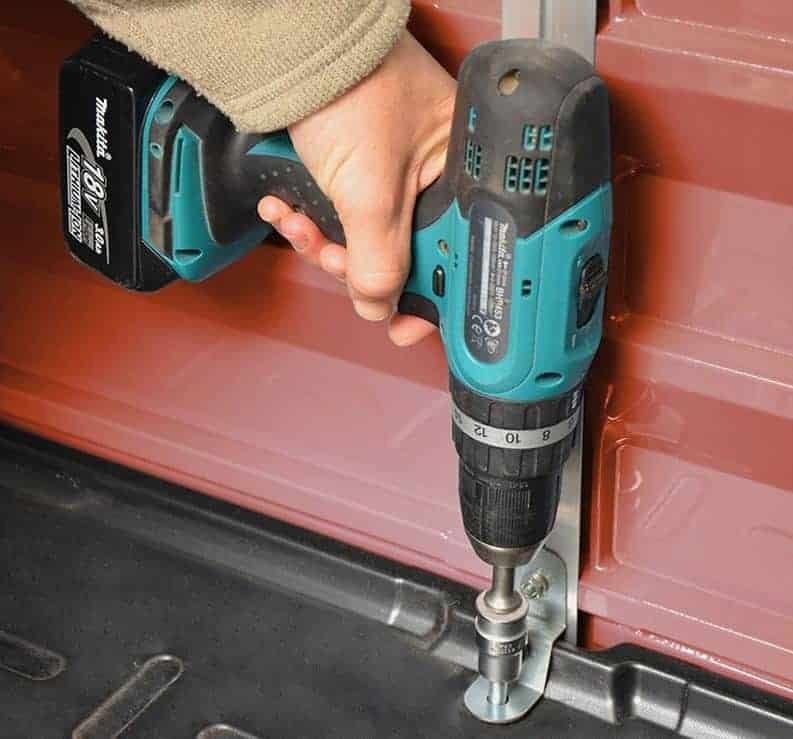 Thanks to how private and secure the shed is, you will feel very comfortable in storing some of your more expensive tools or gardening items inside here as no one will be able to look inside and see what you have. 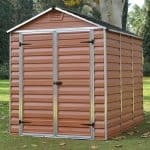 This really is a great looking shed that would look lovely in any garden. 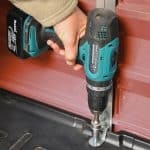 The high quality materials used in the constriction of the shed make it so it will something you can use for many years. The whole shed is made from high impact polycarbonate panels which are very durable and can take a lot of abuse from the weather, the odd bang with a mower and even the kids playing near it. The apex roof is made with high quality panels which let in some natural light all the while keeping the rain outside. 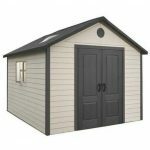 This is a shed that is not only great looking it is also very strong and will last you for a long time. 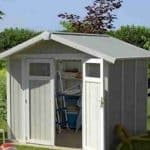 We really do love the overall design of this shed and are sure it is going to be a structure that many people are going to love to show off in their garden. The width that you have here is 6 feet 2 inches with a depth of, 9 feet 9 inches. The depth especially makes this a shed where you can really lay this out any way you would like and make great use of all the available space that you have. The ridge of the shed is 7 feet 1 inch which means you have a great amount of headroom right down the middle of the shed. Even the height at the eaves is a respectable, 5 feet 9 inches. The wood brown colour that has been used is very pleasant and it makes the silver that has been used stand out very well. 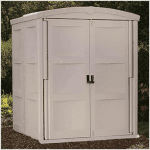 In all we love the style that this shed has and think it would fit in nicely in any type of garden. The apex roof has a fantastic look to it, but as good looking as the roof is, it is also very practical at protecting what you have inside from the elements. These roof panels are made with UV polycarbonate which manages to let in some natural light all the while keeping the rain off. The apex style of the roof also will keep the rain from pooling on the roof so you do not have to worry about it getting inside. The 6’x10′ Palram Amber 68 Skylight Shed has a very clever design to it where at first glance or from a few meters away it does look like it is made from wood, but actually this is made from high impact polycarbonate panels which are a very strong and long lasting plastic. This is very high tech stuff and just so incredibly strong at taking anything our weather can throw at it and also be up to the task of taking the abuse of kids if you have kids running around your garden. For the frame, Palram have made use of an aluminium frame. 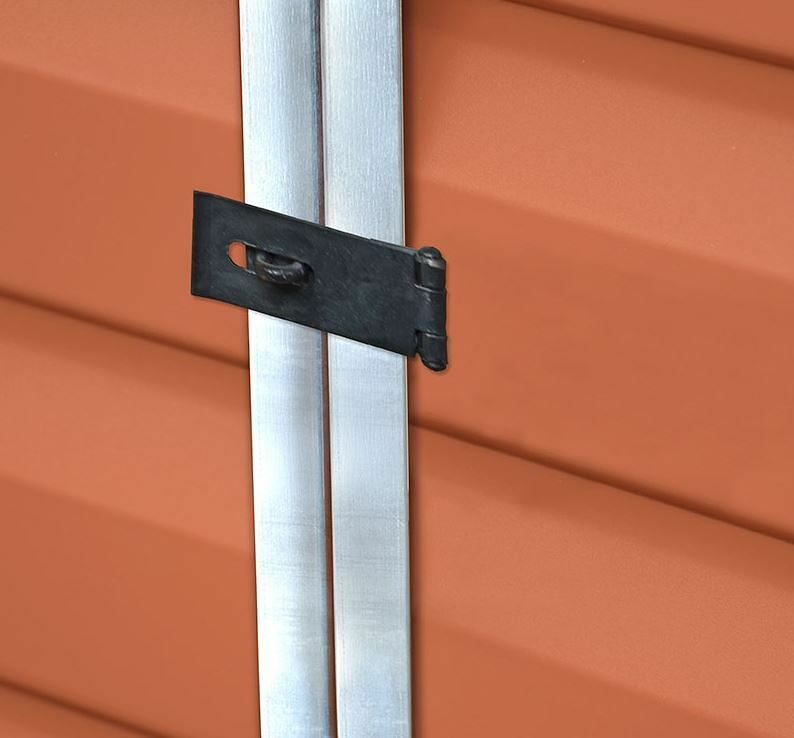 This works very well with the high impact polycarbonate panels to make certain that the shed stays strong and secure for lots of years. Apart from making the shed strong another thing we love about this frame and the panels is just how hassle free it makes building the shed. 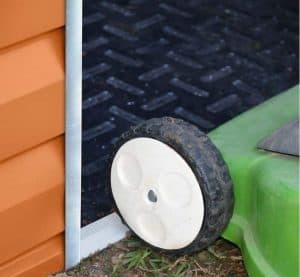 The flooring was the thing that really surprised us about this shed and we do not mean that in a bad way either. The floor is made from polycarbonate flooring which has an anti slip coating on it. This floor is far stronger than you would think and the anti slip nature of it makes keeping it clean and free from mud and anything you may spill on it very easy. The fact that the 6’x10′ Palram Amber 68 Skylight Shed is so low maintenance is something we are sure is going to make it very attractive for a large number of people. 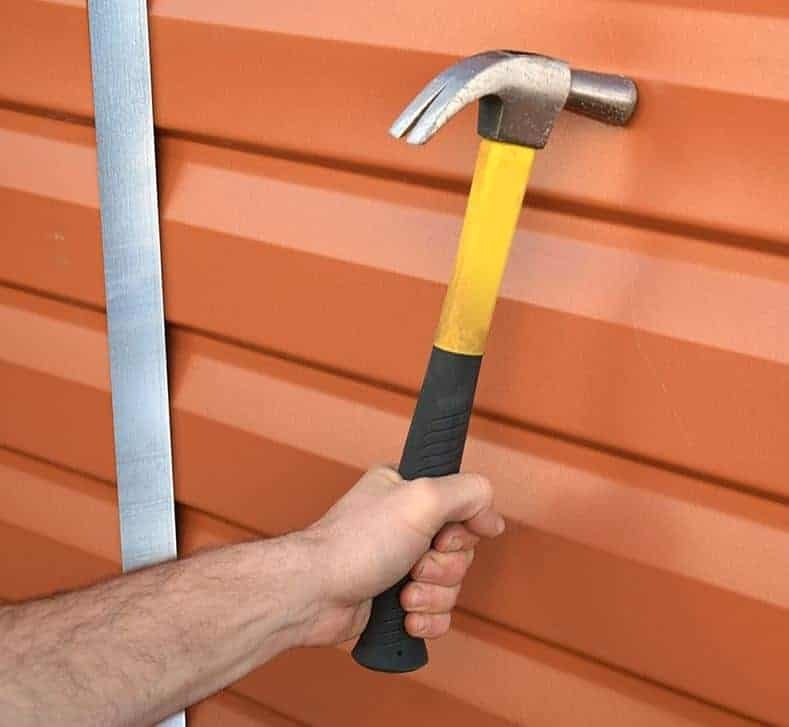 Wooden sheds 99/100 require some kind of annual treatment, but here you literally do not have to lift a finger. This shed requires no annual maintenance in order to keep doing its job. 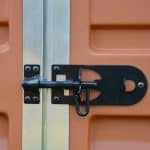 The only thing you will have to do and even then this is not essential to the functioning of the shed. Is give it a clean every now and again if it gets dirty. Palram offer a very generous ten year warranty. However we feel that the materials that are used here will make it so you never have to worry about using it. Still it is good to have it just in case. The doors are something that impressed us a great deal as they have this very workshop style look to them. They are done in a brown wood colour with a very cool looking silver effect. The doors when open offer you 5 feet 7 inches in height and 4 feet 2 inches in width. We feel that this is a lot of room and moving things into the shed and getting them back out will not be any problem. 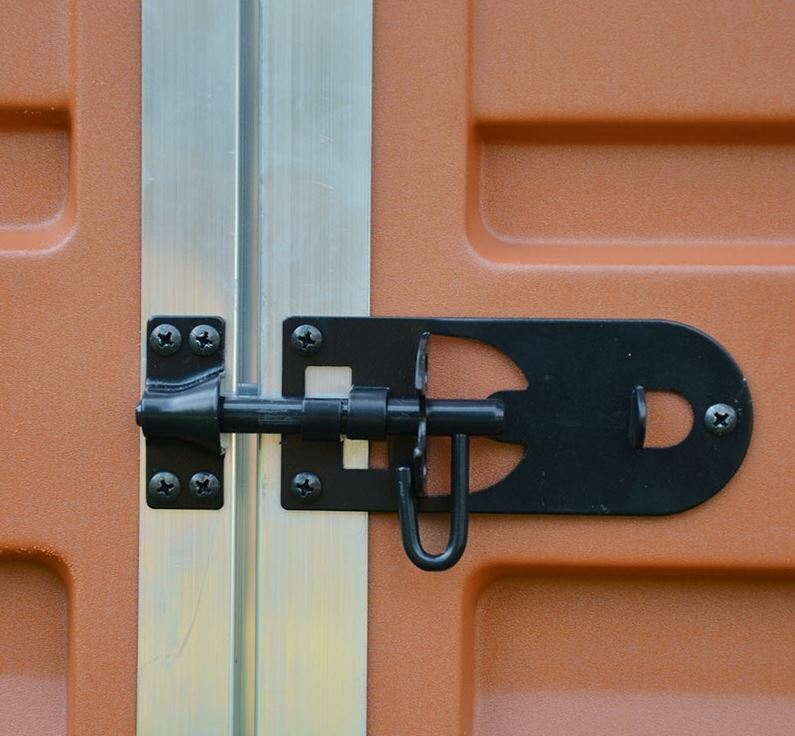 Both the doors use these high quality black hinges to keep them secure and in place. There are no windows which is usually the case for a shed that is built out of materials such as this. The polycarbonate panels offer you a very secure place to keep your items. 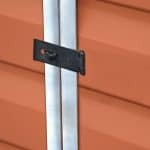 The door does come with a latch to keep the doors from swinging open in the wind, but if you want to add a lock then a padlock is the easiest and cheapest way to do so. With the large double doors closed, nosey neighbours are out of luck as there is no way for them to be sneaking a look inside. 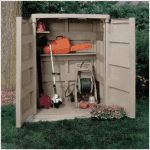 This makes the 6’x10′ Palram Amber 68 Skylight Shed a very private place to store your things. We love the look of this shed as it is and would not change it in anyway, but actually that is a good thing as there is no way to change the look or colour of this shed. Palram though have been careful with their colour selection by making sure this will fit into any style of garden. We always love it when a shed comes with everything you need and that is the case here. No hidden extras are required and that is something we like. Of course you may want to buy a padlock, but with how cheap they are it is really not a big deal. We were very impressed with the high quality and durability of those polycarbonate panels. The whole structure just has a very top of the line, high quality type of look and feel to it. We love how long lasting these materials are and as a huge bonus they do not require much looking after from you. For this kind of price the storage space that you are getting really is incredible. You will be wondering just how you are going to make good use of it all the first time you see it. This is a two person job, but these polycarbonate panels are far easier to put together than standard wooden cladding as most parts just slot together. This is a shed that is going to last you lots of years and it has a huge amount of space. We certainly feel that this is fantastic value for money. Final Thoughts: Before you even read about how strong and reliable the high impact polycarbonate panels are and just how top quality the shed is over all, you will be impressed by the 6'x10' Palram Amber 68 Skylight Shed because it has such a great look to it. 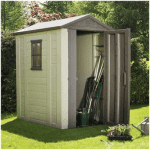 We feel that no matter if you want a shed to keep your mower, rakes, shovels and other gardening supplies safe and rust free or if you just need that extra storage space to declutter the house or have a place to store the kids garden toys, you will love this shed. 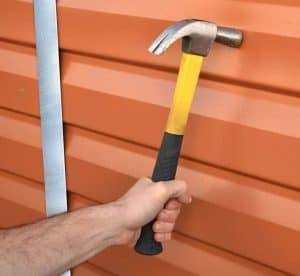 Getting a shed at this price which offers such a vast amount of storage space and is so low maintenance is very rare and we are sure no matter who buys this that they will be very happy with it.